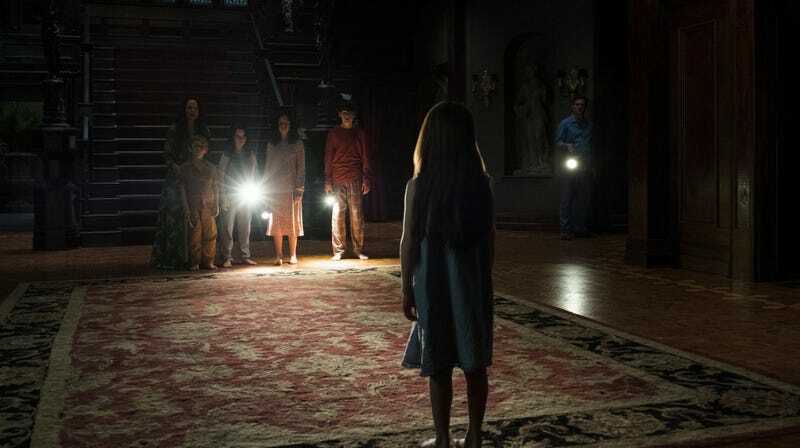 There are plenty of striking visuals in Netflix’s The Haunting Of Hill House—many of which involve creepy bowler hats and bent necks—but it’s safe to say the most memorable visual moment happens in episode six, “Two Storms.” Well, maybe it’s more accurate to say that the impressive visual is episode six, considering the majority of the episode consists of five incredibly long takes. It begins with the kind of seamless, extended shot you don’t even realize is happening until a couple minutes go by and it occurs to you there hasn’t been a single edit, and it only gets better from there. Recently, series director Mike Flanagan took to Twitter to give a little background info on how this amazing feat of filmmaking was pulled off. Once the elaborate set was constructed—complete with hidey-holes and secret shortcuts for the actors—blocking rehearsals began in earnest. Flanagan and his team spent weeks working with stand-ins before the cast ever arrived on set, making sure all the cameramen could hit their marks and the “hundreds of individual lighting cues” were timed perfectly. Then, the actors arrived and they rehearsed all over again, and again, and again. As the Twitter thread goes on, the director describes the events of the actual shoot with surprising clarity, breaking down the logistical pitfalls of each of the five shots. The third shot—an 18-page emotional climax taking place in the funeral home set—proved to be the most difficult. You can read Flanagan’s full, detailed thread here, which gives plenty of insight into this amazing technical feat.